The red is hot! Everyone is talking of China, Chinese culture and Chinese way of living as Beijing gets set for Olympics. This is the perfect time to serve your business buddy or a crucial corporate contact an authentic Cantonese or Hakka fare. Unraveling Chinese kitchen secrets at an authentic Chinese restaurant will make a mouthwatering gift. We suggest a few awesome options for traditional Chinese cuisine. Sem Mon Ling or Nini, as he’s called, has his roots firmly in the restaurant business. His father, a trader from Swatow in China who migrated to India in 1937, started one of the earliest Chinese restaurants in Colaba, Mumbai. It was called Nanking, and along with Kamling in Churchgate, it was the only surviving Chinese restaurant of its time till 1995, when it had to be shut down because of rising rents in south Mumbai. Nanking served simple, home-style Cantonese food. “Our parents struggled against all odds to set up our legacy,” says Nini. At that time, Nini was studying in North America, where he later worked as an electronics design engineer. But the family business beckoned, and in 1986, he left his job to join his father and brother, Baba Ling, at the restaurant. The brothers wanted to raise the bar and have a bigger place that would cater to a clientele different from that which Nanking had had for years. Ling’s Pavilion opened in 1991. “Although it’s more spacious now, we have maintained the homely atmosphere,” says Nini. The restaurant staff is friendly, the ambience warm, and the food delicious. According to its owners, 80% of the clientele consists of regulars who have been coming here for years. “The credit goes to my entire family, my brother Baba and our wives, who are active participants in the running of the business,” he adds. Baba went on to open a branch of Nanking in New Delhi a few years back and another in Bangalore recently. When Ling’s Pavilion opened, clay-pot rice and bamboo rice were innovative dishes on an Indian-Chinese menu. They continue to be favourites among loyal customers. The spare ribs, available in three flavours, and the Chimney Soup are legendary in the city. The huge pot in which the Chimney Soup is served has underwater delicacies boiling in a delicious broth. Vegetarians will love Ling’s Buddha’s Delight, with chunky cut vegetables, such as broccoli, asparagus, water chestnuts, mushrooms and carrots, in a mild sauce. As is the case for many Chinese families now settled in Mumbai, this family’s story doesn’t begin in China. Tham Mon Yiu, who was born in Kolkata to a family of hairdressers in 1931, moved to Mumbai about 60 years ago, and started a hair salon with his wife. But his business acumen told him to turn to the restaurant business and he bought an existing Chinese restaurant near the Gateway of India, Colaba. Mandarin opened in 1968 and went on to become a popular Chinese eatery. Tham was also one of the partners at Kamling, a Chinese restaurant that was was set up in 1969 to cater to Chinese sailors who visited Mumbai for trade. Kamling continues to attract many Mumbaiites too. Three years ago, the new generation of Thams, which included Tham Mon Yiu’s son Henry and grandsons Ryan and Keenen, decided it was time to give things a new spin. Henry Tham, then a partner at Olive, decided to concentrate on renovating Mandarin. His sons, who were studying restaurant management in Australia, returned in time to join in. The change had to begin with the name. Mandarin was a Chinese food joint open to everyone; Henry Tham was planned as a fine-dining restaurant and lounge. They also decided to do away with the accoutrements of Chinese kitsch decor—dragons, red tassels, lanterns and lots of gold—for a classic, elegant look. “I wanted to change the positioning, and so creating the right impression was essential,” says Henry. His sons were instrumental in envisioning the trendy bar and lounge. Popular with the swish set from the very beginning, Henry Tham’s bar is known for its cocktails, such as Pomegranate Martini, Asian Infusion and Cuban Island, and is packed on weekends when live bands play. A few dishes have been retained from the Mandarin menu but the food now is “contemporary Chinese”, as Henry likes to call it. Sample their Shredded Lamb in Garlic Foam, served in a martini glass, or the Prawns in Wasabi Mayo, and you’ll know what he means. The restaurant is most popular for its set lunch menus, priced between Rs490 and Rs750. Xie Ying Xing came to India from China in 1956 as an eight-year-old to join his father, who worked in the tanneries of Tangra. “In those days there was a direct steamer service between Kwantung and Calcutta,” says Xing, 60. Though his family, being Hakka, were tanners, Xing dabbled in the restaurant business as a youngster, working for Park Street big names such as Bar-B-Q and Waldorf. From 1986 to 2003, Xing was busy with his tannery. It was only when the tanneries of Tangra were required to shift to a new leather complex far away that Xing, like many other local tanners, decided to take up the restaurant business. “I was always interested in food so the shift wasn’t too difficult,” he says. Big Boss, so named because Xing and his sons Edward and Edwin want it to be the biggest and best of the Tangra restaurants, can comfortably seat 300 people on its two floors—the ground floor being set aside exclusively for men. It has a well-stocked bar, but the decor is a little cavernous and assembly-line, perhaps owing to its tannery lineage. There is also a surfeit of plastic and chrome but overall, the ambience is warm and clean. The restaurant’s staff is friendly, and here’s an authentic Chinese menu, apart from the standard Indian-Chinese fare. “That is meant for Chinese visitors as locals find it rather bland,” says Xing. “I go to the market myself to buy supplies so that only the best enters our kitchen,” adds Xing, whose family lives on the floor above the restaurant. Big Boss is clean and the staff, though a little clueless at times, is friendly and eager to help. However, the biggest plus is the restaurant’s multi-level parking, which comes in handy during weekends and festivals, when the serpentine lanes and bylanes of Tangra are chock-a-block with cars. Their best includes the Eggdrop Tomato Soup, Whole Steamed Bhetki, Zap Kim, Prawn Wat Dan and Ma Po Tofu. The Huang family—Joseph, Josephine, Joel and Jennifer—claim that theirs is the oldest Chinese-owned restaurant in the country. Set up by Achumpa Huang in 1927, Eau Chew has been going strong despite its unusual location on Mission Row in the central business district, and rather dour demeanour. “The pots we use in our signature Chimney Soup are the ones he (Achumpa) got from China,” says Joseph, who has never hired a cook, and mans the kitchen himself with help from wife Josephine and son Joel. “My sister wasn’t too keen on the restaurant business,” says Joel, who says he loves messing around with pots and pans. Eau Chew is located on the first-floor of a derelict building behind a petrol pump which houses mostly offices. One has to scale a steep flight of stairs to reach the restaurant whose décor is spartan at best, with mica-topped tables sans tablecloths and a bare floor. The menu card is a four-page laminated affair. However, the delicacies that stagger out of the kitchen more than make up for this. The food is served by family members, generally Joel—he can be a bit brusque at times, but compensates by adding a personal touch to all he does. Most of Eau Chew’s clients are regulars who know exactly what they want, and it’s not unusual to spot one of the Huangs parked with a diner, chatting like old friends. The Chimney Soup, to do justice to which at least six very famished people need to be roped in. All sorts of vegetables, meat and seafood are dunked in the soup, which is kept on the boil by the burning coal placed under the container, while a chimney allows the steam to escape. There’s also Chicken Satay (strips of chicken marinated and skewered), Stuffed Sugarcane (chicken pieces stuck to sugarcane), Roast Chilli Pork and the most unique item—off the menu and available only on request—Josephine noodles, named after the lady of the house. It’s a complete meal by itself. Lu, who grew up in Dehradun, speaks better Hindi than most Delhiites. “Unka uchcharan theek nahin tha (their pronunciation wasn’t correct),” he says when speaking of the hardships his grandfather’s generation of Chinese had to face in India. His restaurant can be best described as modest, and is located in Connaught Circus. “We don’t serve authentic Chinese food here,” says Lu, who has spent the greater part of his working life in the employ of different luxury hotel groups. The Crispy Shredded Lamb, Chilli Chicken with Black Bean Sauce for non-vegetarians and Vegetable Teppanyaki are good choices. 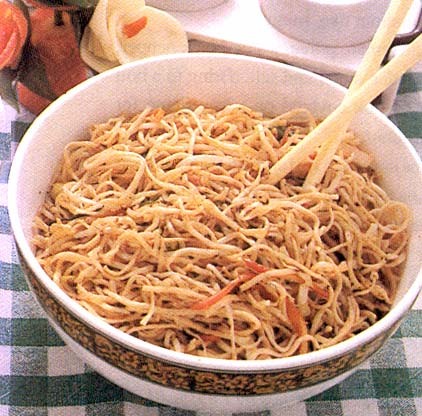 The entrées are supplemented by vegetarian Hakka noodles and vegetarian fried rice. The meal is hearty and completely along expected lines. The vegetables in the Teppanyaki are lightly cooked and therefore a bit crunchy, and retain their natural flavours. They could be a bit bland for Indian tastebuds, but make for a refreshing change. Chinese food always makes your mouth watered.. the tatse and smell really brings out the flavor of so many ingredients mixed in their food…. What exclusive and exotic gifts to get from China?